Astronomers have spotted the farthest-flung galaxy in the known universe. 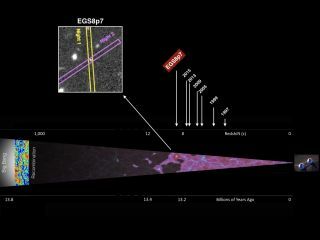 The newfound galaxy, known as EGSY8p7, lies about 13.2 billion light-years from Earth — meaning astronomers are now seeing the mass of stars as it existed just 600 million years or so after the Big Bang that created the universe. The discovery team used an infrared spectrograph at the Keck Observatory in Hawaii to detect EGSY8p7's "Lyman-alpha emission line" — basically, hydrogen gas heated up by ultraviolet radiation streaming from the galaxy's newborn stars. Seeing a Lyman-alpha line at such a great distance came as a surprise to the researchers. "We frequently see the Lyman-alpha emission line of hydrogen in nearby objects, as it is one of the most reliable tracers of star formation," study lead author Adi Zitrin, of the California Institute of Technology in Pasadena, said in a statement. "However, as we penetrate deeper into the universe, and hence back to earlier times, the space between galaxies contains an increasing number of dark clouds of hydrogen, which absorb this signal." The unexpected result could shed new light on how the universe evolved in its youth, researchers said. For example, astronomers think the universe was completely opaque to Lyman-alpha emission for about 400 million years after the Big Bang, thanks to that pervasive hydrogen. But things then began changing, as the first galaxies formed; radiation from their stars started splitting the hydrogen into its constituent protons and electrons. This process, known as "cosmic reionization," probably proceeded gradually, with hydrogen being burned off in numerous localized but ever-expanding bubbles, researchers said. These bubbles eventually met and overlapped, making the universe transparent to Lyman-alpha light. The detection of EGSY8p7's Lyman-alpha emission suggests that the reionization process was far from uniform, with some patches of space cleared of hydrogen much faster than others (perhaps because the newborn stars in such regions were exceptionally powerful), researchers said. "In some respects, the period of cosmic reionization is the final missing piece in our overall understanding of the evolution of the universe," Zitrin said. "In addition to pushing back the frontier to a time when the universe was only 600 million years old, what is exciting about the present discovery is that the study of sources such as EGSY8p7 will offer new insight into how this process occurred." The study announcing EGSY8p7's detection will be published soon in the Astrophysical Journal Letters.